You’ve always dreamed of living in the Calgary area, but have never found a house that suits your fancy. Until now. 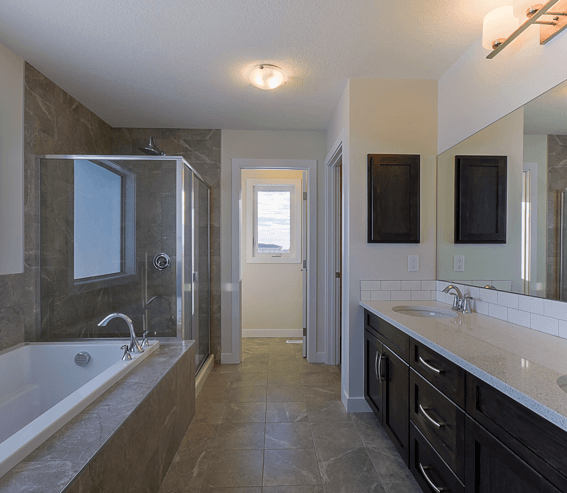 There’s a quick possession home available on 26 Coopersfield Park in Airdrie in the Coopers Crossing neighbourhood. This is your official introduction to the Bentley! 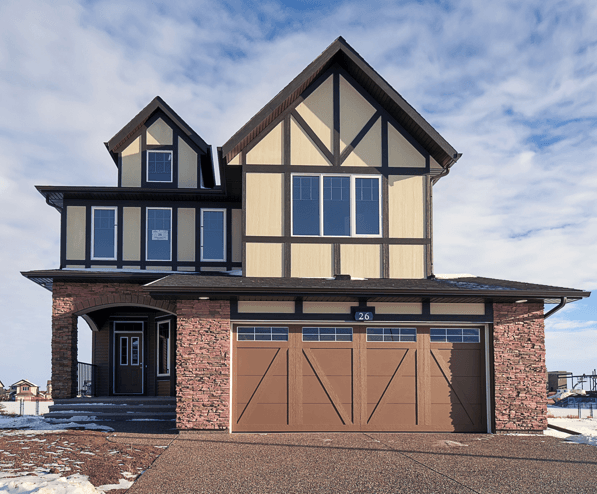 The Bentley on 26 Coopersfield Park in Airdrie has 2,554 square feet of space. With three bedrooms and two and a half baths, this home provides plenty of room for a growing family. The two-car garage is perfect for two family vehicles or one family vehicle and a collection of bicycles, sports equipment, tools and more. Before stepping into the spacious foyer of this home, enjoy the lovely view from beneath its covered porch. This porch is the perfect place for a few hanging plants and maybe even a pot or two of flowers to serve as a pleasant welcome to visitors. Enter the home’s foyer and hang up your coat in the closet with lots of space for hats, coats, umbrellas, gloves and more! Next, head down the hallway to the convenient half-bathroom to freshen up before entering the kitchen area. The first thing you’ll notice in the kitchen is the expansive island complete with sink and cozy breakfast bar. Just imagine you and your kids enjoying a snack together or chatting before heading off to school and work in the morning. Plus, you’ll appreciate the extra counter space provided by the island whether you’re preparing the Thanksgiving meal or making cupcakes for the school bake sale. The open design of the Bentley means family members and friends can chat with one another whether they’re in the kitchen, dining room or great room. The great room has lots of natural light and nine-foot ceilings making it an airy, welcoming place to spend time watching movies, doing homework or just enjoying some quiet time. Take the stairs to the upper floor and stroll down the hallway to peek into the two large bedrooms. These rooms provide an abundance of space for kids, teens, grandparents or guests. The fully-equipped main bathroom is accessible to occupants of both bedrooms. Are you searching for a home with a luxurious master bedroom? The Bentley has it in spades! The soft, natural light pouring into the master bedroom gives any sort of décor an extra dose of beauty. The walk-in closet just off the master bedroom can house your clothing, shoes, hats and other accessories in an organized, appealing way. The Bentley boasts a five-piece ensuite with shower, bathtub, double sinks and toilet. Just envision yourself sinking into a fragrant bubble bath. It’s like enjoying a peaceful getaway without leaving home! The fully-outfitted laundry room in the Bentley is located in a central area on the upper floor. Built-in shelving gives you a place for organizing all of your laundry supplies, so you know what you have at a glance. A mudroom located just off the garage for wet coats, muddy boots and umbrellas. A flex room on the main floor to use as an office, a playroom, extra storage and more. A walk-thru pantry in the kitchen for all of your canned goods, spices, dry goods, extra utensils and other necessities. A built-in computer centre for balancing the chequebook, completing homework and other important tasks. Coopers Crossing, is made up of 300 picturesque acres of parkland. This home also backs right onto lush green space. Just imagine yourself opening your back door to see trees, flowers, plants and grassy areas as far as the eye can see. Parents considering this quick possession home in Airdrie will be glad to know there are quality schools nearby. In fact, kids can safely walk to and from school each day. No more missing the bus in the morning and being late to school! Whether you need to dash to the pharmacy to refill a prescription, head to the grocery store, buy some pet food, visit the dentist or get a haircut, the neighbourhood of Coopers Crossing has everything you need and want close at hand. You can get all of your errands done and have time leftover to window shop. Plan a date night at one of the restaurants nearby or grab some fast food for the family waiting at home. You have a choice of places available to you just a short distance from home. Plenty of Places to Play! Genesis Place Recreation Centre is an option for you if you make the decision to move into this quick possession home. Swim, exercise or take a class as a family! Access to playgrounds and walking trails make this neighbourhood inviting and family-friendly. Contact us for more information about this quick possession home located at 26 Coopersfield Park in Airdrie. Start on the path to living the life you want in the Coopers Crossing neighbourhood today!